03/06/2017 5:00 PM GMT - 03/17/2017 8:57 PM GMT CLOSED! 1. All sales are final. 2. A Buyer’s Premium at a rate of 20% will be applied to all winning bids. 3. Payment (either in full, or the deposit payment if utilising the payment plan option) must be received within 7 days of the initial purchase. 4. Payment plans will be available in 1, 2, or 3 month increments. Bidders utilising the payment plan service will be responsible for paying a 20% deposit on their Lots within 7 calendar days of receiving their invoice. The balance will then be split over 1, 2 or 3 months per the Buyer’s selection. If the 1 month option is selected, the remaining balance on the Lot will be due 30 days after the deposit date. If the 2 month option is selected, half of the remaining balance will be due 30 days after the deposit date and the remaining half 30 days after that, and so on. Prop Store offers no grace period on payment plan deadlines. If the Buyer does not adhere to payment deadline as agreed under the terms of the payment plan, the Buyer will have defaulted. In the event of default all funds already paid to Prop Store will be forfeited by the Buyer, and title of the Lot will not transfer to Buyer. Prop Store and the Seller shall also be entitled to all remedies for non-payment as described below and at law. 5. Prop Store vouchers and other discount codes are not valid as payment for auction items. 6. 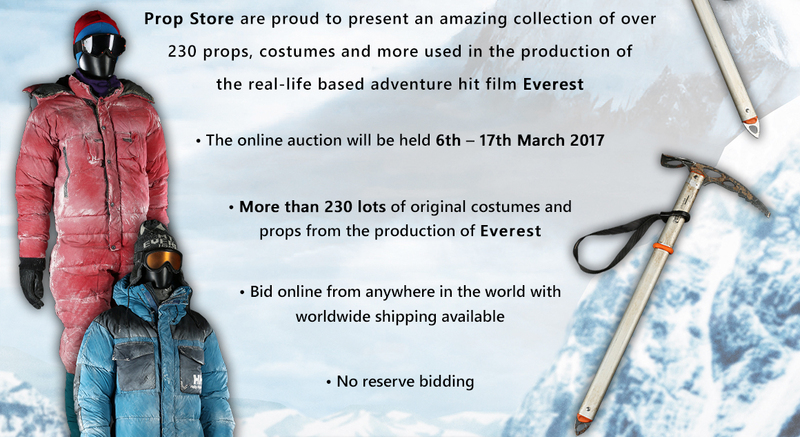 Please note that multiple costumes and props are produced for specific filming requirements. 8. Bidder agrees that Prop Store will charge the credit card provided at registration for all items purchased at auction, and any future Prop Store auctions in which the Bidder participates if not paid within 7 calendar days after the close of the auction. 10. The copyright in all images, illustrations and written material produced by or for Prop Store relating to this auction, is and shall remain at all times the property of Prop Store. The copyright in all images, illustrations and written material produced by or for Walden Media relating to this auction, is and shall remain at all times the property of Walden Media. The copyrighted material shall not be used by the Buyer, nor by anyone else, without Prop Store’s written consent. Prop Store and Walden Media make no representation or warranty that the Buyer of a Lot will acquire any copyright or other reproduction rights in it. 11. Prop Store neither warrants nor represents that your use of any materials displayed on the site will not infringe rights of third parties not owned by or affiliated with Prop Store. 12. While Prop Store uses reasonable efforts to include accurate and up to date information in this auction, Prop Store makes no warranties or representations as to its accuracy. Prop Store assumes no liability or responsibility for any errors or omissions in the content of the auction. 13. All items are sold as collectibles and/or memorabilia for display purposes only, and are not deemed, intended, represented, or implied to be fit for any other purpose. Buyer assumes all risks of loss and/or injury, including, but not limited to, personal injury or property damage, arising from or related to any other use of the item. Buyer understands and agrees that Prop Store shall have no liability for any such loss or injury and Buyer expressly releases Prop Store from any such loss or injury, save that, in the UK, Prop Store does not exclude or limit its liability for (1) death or personal injury caused by our negligence; (2) fraud or fraudulent misrepresentation; or (3) any breach of your statutory rights to title and quiet possession of the items; or (4), only if you are a consumer, any breach of your statutory implied rights under sections 13 to 15 of the Sale of Goods Act 1979. 14. Your use (including browsing) of this auction is at your own risk. Neither Prop Store nor any other party involved in creating, producing, or delivering this listing is liable for any direct, incidental, consequential, indirect, or punitive damages arising out of your access to, or use of, the site. Prop Store also assumes no responsibility, and shall not be liable for, any damages to, or viruses that may infect, your computer equipment or other property on account of your access to, use of, or browsing in the Site or your downloading of any materials, data, text, images, video, or audio from the site. 15. Prop Store guarantees the authenticity of Attribution of property listed online as stated in the Terms of Guarantee (set out below). Except for the Limited Warranty contained in the Terms of Guarantee all items are sold "As Is." To the fullest extent permitted by law, we make no warranties as to the merchantability or fitness for a particular purpose, the correctness of the description of the physical condition, size, quality, rarity, importance, medium, provenance, exhibitions, literature or historical relevance of any items sold by us. No oral or written statements made in the online listing, advertisement, and bill of sale or elsewhere made by employees (including affiliated and related companies) shall be considered a warranty or representation. To the fullest extent permitted by law, we are not responsible for errors and omissions in the online listings or any other supplemental material. Prop Store assumes no liability or responsibility for any errors or omissions in the content of its website. 16. Please note that some jurisdictions may not allow the exclusion of implied warranties, so some of the above exclusions may not apply to you. Check your local laws for any restrictions or limitations regarding the exclusion of implied warranties. 17. Any reference image appearing within Prop Store's auction listings are solely for reference purposes and are not intended or deemed to be a representation or warranty of the item depicted within the image. 18. Please note that the purchase of these items does not include ownership in or to the trademarks registrations, copyrights and/or any other intangible intellectual properties associated with this item. Therefore purchase of this item does not permit the purchaser to replicate or to exploit this item otherwise. All said intellectual property rights remain permanently vested in and with Walden Media or its successors. 19. Buyer agrees to indemnify and hold harmless Prop Store and its directors, employees, affiliates, contractors and agents from any third-party claims, actions, suits, judgments, losses, damages, costs and expenses (including reasonable attorneys’ fees) asserted against or incurred by Prop Store that arise out of or result from any act or omission by Buyer arising out of or relating to Buyer’s infringement of any copyrights or trademarks in or to the items or Images. 20. If any applicable conditions herein are not complied with (to a material extent), buyer will be in default and in addition to any and all other remedies available to us by law, including, without limitation, the right to hold buyer liable for the total purchase price, including all fees, charges and expenses more fully set forth herein, we, at our option and to the extent permitted by law, may (a) cancel the sale of that, or any other items sold to the defaulting buyer, retaining as liquidated damages all payments made by buyer, or (b) resell the purchased item, or (c) effect any combination thereof. In any case, buyer shall be liable for any deficiency, any and all costs, handling charges, late charges, expenses of both sales, legal fees and expenses, collection fees and incidental damages. We may, in our sole discretion, apply any proceeds of sale then due or thereafter becoming due to buyer from us or any affiliated company, or any payment made by buyer to us or any affiliated company, where or not intended to reduce buyer’s obligations with respect to the unpaid item or items, to the deficiency and any other amounts due to us or any affiliated companies. In addition, a defaulting buyer will be deemed to have granted and assigned to us and our affiliated companies, a continuing security interest of first priority in any property or money of our owing to such buyer in our possession or in the possession of any of our affiliated companies, and we may retain and apply such property or money as collateral security for the obligations due to us or to any affiliated company of ours. Payment will not be deemed to have been made in full until we have collected good funds. 21. Save where expressly stated to the contrary above, under no circumstance will Prop Store incur liability to a buyer in excess of the purchase price actually paid. 22. Neither party will be liable or responsible for any failure to perform or delay in performance of any of its obligations that is caused by an event outside its reasonable control including, without limitation, industrial action, civil commotion, war, terrorist attack, fire or natural disaster or failure of third party public or private transport. 23. Each sentence and paragraph of these terms operates separately and if any court or relevant authority decides that any of them are unenforceable, the remaining paragraphs will remain in full force and effect. 24. If we delay or fail to insist that you perform any of your obligations under these terms it will not mean we have waived our rights. “Attribution” is defined by Prop Store as the production association and usage of the piece, as the case may be as set forth in the Title of an online listing, as amended by any online notices and announcements at the time of sale. We make no warranties as to information not contained in an online item heading or description subject to the exclusions listed below. Prop Store warrants the “Attribution,” as defined above and subject to the exclusions listed below, of an item as backed by a certificate of authenticity (“COA”). Our COA is reinforced by a lifetime, money-back guarantee. If it is determined to our satisfaction that the “Attribution” is incorrect, the sale will be rescinded if the item is returned to Prop Store’s warehouse facility in the same condition in which it was at the time of sale. In order to satisfy Prop Store that the “Attribution” of an item is indeed incorrect, we reserve the right to require the buyer to obtain, at the buyer’s expense, the opinion of two experts in the field, mutually acceptable to Prop Store and buyer, before we agree to rescind the sale under the warranty. COAs cannot be reissued, so please take care to keep your COAs safe. Our COAs are transferable to a new owner. Each item is allocated a unique serial number which enables us to store the original sale on our database. As long as our original COA accompanies the original item, we will treat any inquiry regarding the “Attribution” as if it was from the original buyer. Should a sale be rescinded and the purchase price paid, it is specifically understood that this will be considered the sole remedy. To the fullest extent permitted by law, it is exclusive and in lieu of any other remedy available as a matter of law, or in equity. Exclusions will be made and this warranty does not apply to “Attribution” which on the date of sale was in accordance with the then generally accepted opinion of scholars and specialists, or the identification of periods or dates of execution which may be proven inaccurate by means of scientific processes not generally accepted for use until after publication of the listing online, or which were unreasonably expensive or impractical to employ. Customers will be charged in GBP. For all sales within the EU, VAT (Sales Tax) at the prevailing rate (currently 20%) will be applied to the winning bid and Buyer's Premium. Delivery addresses outside the EU will be exempt from VAT.Accepted payment methods are VISA, Mastercard and American Express. Bidder agrees that Prop Store will charge the credit card listed provided at registration for all items purchased at auction, and any future Prop Store auctions in which the Bidder participates if not paid within 7 calendar days after the close of the auction. Customers will receive their invoices once the final lots have closed, to allow combined shipping. If the excitement is simply too much and you would like to pay and ship your auction wins immediately, please let us know. Tell you about other goods and services that might interest you. We will also let other people do this, and we (or they) may contact you. If you are already our customer, we will only contact you electronically about things similar to what was previously sold to you. If you are a new customer, you will only be contacted if you have consented to it. If you don't want to be contacted for marketing purposes (by us and/or third parties, please tick the relevant box that you will find on screen to opt out. Please note: We don't identify individuals to our advertisers, but we do give them aggregate information to help them reach their target audience, and we may use information we have collected to display advertisements to that audience. We may transfer your collected data to storage outside the European Economic Area (EEA). It may be processed outside the EEA to fulfil your order and deal with payment and/or provide support services. By giving us your personal data, you agree to this transfer, storing or processing. We will do what we reasonably can to keep your data secure. Payment will be encrypted. If we give you a password, you must keep it confidential. Please don't share it. Although we try to provide protection, we cannot guarantee complete security for your data, and you accept the risk that any sending data may not be secure despite our efforts. We can exchange information with others to protect against fraud or credit risks. We can disclose it to business partners, suppliers and contractors for the performance of any contract we enter into with them or you. We can provide it to analytics and search engine providers that assist us in the improvement and optimization of our site. We can disclose it in order to enforce our terms and conditions http://www.propstore.com/cms/terms-and-conditions/and any other legal agreements. You can ask us not to use your data for marketing. You can do this by ticking the relevant boxes on our forms, or by contacting us at any time at tim@propstore.com. The Data Protection Act 1998 gives you the right to see information we hold about you. We can charge you a fee (currently £10) for this service. Please note that our terms and conditions and our policies will not apply to other websites that you get to via a link from our site. We do not accept any responsibility or liability for data use on such websites.